Niagara Falls, NY - Niagara University Hospitality & Tourism major Natalie Slipko gets the scoop on jobs at Gray Line of Niagara Falls from Director of Group Sales Verity Folan. 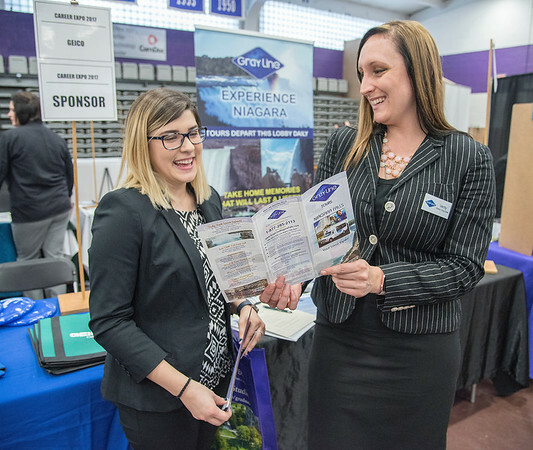 Niagara University held a career expo at the Gallagher Center with more than 70 empolyers. NIAGARA UNIVERSITY, N.Y. (March 7, 2017) - Niagara University is hosting a Career Expo on Thursday, March 30, from 1-3:30 p.m. in the Gallagher Center gym. More than 70 employers will be on campus looking to hire college students, new graduates and young professionals for full-time, part-time, internship and summer opportunities. The event is open to all students and alumni of Western New York-area colleges. For more information, please contact Niagara University's Office of Career Services at 716.286.8500 or careers@niagara.edu. Founded by the Vincentian community in 1856, Niagara University is a comprehensive institution, blending the best of a liberal arts and professional education, grounded in our values-based Catholic tradition. Its colleges of Arts and Sciences, Business Administration, Education, and Hospitality and Tourism Management offer programs at the baccalaureate, master's and doctoral level. As the first Vincentian university established in the United States, Niagara prepares students for personal and professional success while emphasizing service to the community in honor of St. Vincent de Paul. Niagara's institutional commitment to service learning has led to its inclusion on the President's Honor Roll for Community Service every year since its inception in 2006, and its recognition with the Carnegie Foundation's Classification for Community Engagement.